If you’re looking to extract the audio from Flash Video files (FLV format), there are a few options available. Unfortunately, the choice many of them make for you is to encode the audio stream to a different format. In some cases this isn’t a problem, but if you’re trying to keep the audio identical to what’s inside the video, then you want something that extracts the audio in one piece. FFmpeg, a multimedia toolkit for Linux, can do this with ease. This command will also install quite a few extra libraries (along with FFmpeg), needed for device, format and filter support. Once installed, using FFmpeg is pretty simple, as long as you know which commands to use. There are hundreds of different options, a special syntax to use in different circumstance, and the sheer power and complexity can be a bit overwhelming. Thankfully, for our job, FFmpeg is pretty straightforward. This moves the Terminal program into the same directory (the Desktop in this case), so all of our commands will be active there. This is important because if you tell a program (like FFmpeg) to act on a file, only the file isn’t where the Terminal is “looking” then you will get errors. Note: if you’re trying this along with the tutorial, substitute the name of your file each time you see it used in the commands. The above command is a bit of a hack, and you’ll get errors, but don’t worry. What we’ve actually told ffmpeg is that Bohemian_Rhapsody.flv is the input file. That’s what the “-i” tells ffmpeg. 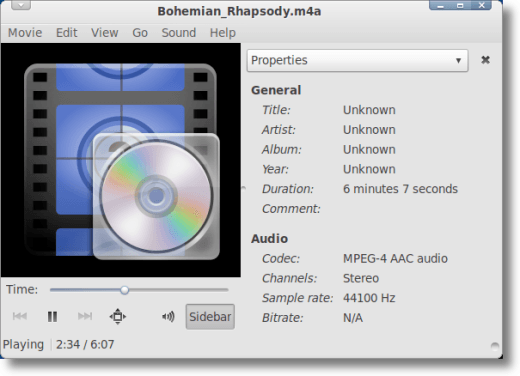 After typing the previous command, only a second or so should go by, and you should notice a new file on your Desktop, named Bohemian_Rhapsody.m4a, which will contain nothing but the original audio track from the original FLV file. Just open it up in your favorite media player and give a listen to make sure everything is as it should be. It’s that simple. Of course, FFmpeg has many, many other options available. You can transcode the audio to a different format, for uploading to a cell phone, MP3 player, or WAV file. You can manipulate the video from the original FLV if you want, fool around with the bitrate, sample rate and number of channels. And maybe you’ll want to learn that later, but for now you know one thing with certainty: it’s simple to use FFmpeg to extract audio from a file in FLV format. Simple, and fast.